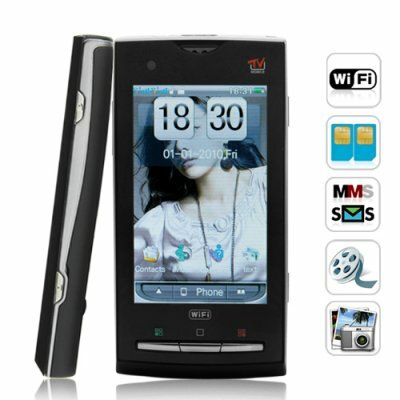 Successfully Added Genova - Quadband Dual SIM Wifi Touchscreen Worldphone to your Shopping Cart. A truly superior cellphone for every aspect of your life. The unlocked Genova mobile phone has it all - quad band worldwide GSM compatibility, dual SIM, java apps, WIFI internet access and it even comes with a free 2GB TF microSD card! Important Stuff: OK, here's what you should know about The Genova. It's a first class quad-band mobile phone that supports the four global standard GSM frequencies (850MHz, 900MHz, 1800MHz, 1900MHz) so you can trust it to work anywhere in the world. It has two SIM card slots which allows you to have two active phone numbers which is perfect for business people. It's unlocked, so you can use it with cellphone network carrier. The Genova also has an awesome 3.25 inch touchscreen and comes with WIFI, so free Internet is always within reach. Just scan for available connections, click "connect", and then start surfing and checking email for free. Throw into this incredible array, Bluetooth functionality, improved firmware and interface, and you have all the makings of a cellphone you'll be proud to own for years to come. Interesting Stuff: We designed The Genova to be a phone with all the features you'll need for years to come. Check this out! It's got a built-in dual front and rear 192,000 pixel digital camera and camcorder, a top of line MP3 / MP4 player that effortlessly rocks your world with MP3, ACC, MP4, FLV, and AVI file playability, the ability to install Java 2.0 apps - and get this, The Genova even comes with an accelerometer mechanism like on the Apple iPhone, so with the flick of your wrist you can change things like your desktop wallpaper or skip to the next song. The Genova is a full-featured intelligent cellphone with a stunning 3.25 inch touchscreen and slide screen main menu just like today's most advanced smart phones. Brought to you by the leader in factory direct China electronics - Chinavasion. Very fast delivery - 6 days to Philadelphia, PA! Everything works as described. It took me a day and half to program but text, mms, WAP and WIFI work well. The sound quality is excellent and has a good solid feel in my hand. The dual camera feature is great, too. Overall, I like it much better than the LG phone this one is replacing. The best part is not being locked into a phone contract anymore. I will be ordering from Chinavasion again soon. And reached its destination ON 21/10/2010 ( ΜΕ ) , VERY GOOD TIME FOR DELIVERY , JUST SOME DAYS THE PILOT WILL I HAVE FULL VIEW OF THE MOBILE . BUT AS A FIRST IMPRESSION .... VERY GOOD !!!!!!!!! It took 1 week to receive the phone in Vancouver,Canada, but I am satisfied with the phone's quality. I will definitely do more shopping with Chinavasion.com. on 2010-07-14 15:44:14 Good product! Strongly recommended! What can i say, fast shipping even to Bulgaria! It came for 9 days. The phone looks and works as expected and shown on description. Some problems with flv format play, each time i've tried to play youtube content ended with phone restart. The ringer is a bit quiet when in pouch or laying on backside on flat surface. Wi-Fi supports even WPA2 and TKIP without problems, the speed is fair. Good touchscreen responsiveness with some slowdowns sometimes, but for it's 100$ value it deserves every cent of it!